Neck spasms may result from strain, overuse, weakness, or muscle pain related to an injury, other disorders or from a reaction to certain medications. If the spasms are strong, there may be pain from a pinched nerve which may cause the pain to radiate into the arm or hand. Spasms may be a simple and mild reaction to stress, muscle guarding from injury, or may indicate a disorder like cervical dystonia (spasmodic torticollis), where they may cause the head to actually turn or to jerk to one side. It may also result from an neck injury such as whiplash or can be symptomatic of conditions like degenerative disc disease, a herniated disc, a possible viral infection, narrowing of the spinal canal (stenosis), tension headaches, infection or inflammation of the covering around the brain and spinal cord (meningitis), or a bone infection (osteomyelitis). Most often, the spasms are caused by muscle strain from physical overexertion, muscle tension from stress, in reaction to pain at other locations, or physical overexertion from heavy lifting or strenuous exercise. For more information see neck pain causes. Muscles in the neck develop spasms that involve muscle contractions. 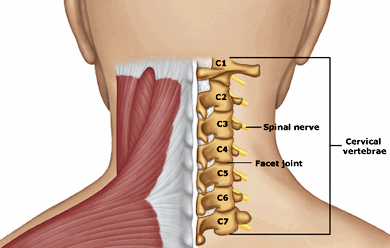 This can result from sudden movements or twisting of the neck which puts compression on the muscle. This can cause excess stretching of the muscles which may tighten leading to pain. The muscle contraction decreases blood flow in the region causes further irritation and pain. This can also result from sleeping in an awkward position that creates pressure on the neck along with other problems related to poor neck posture. Spasms can also be caused by a vitamin deficiency. Nutrients such as vitamin B12 and D are important for normal muscle function and a deficiency can cause muscle spasms in the neck. Other vitamin deficiencies in calcium, magnesium and potassium can also trigger neck muscle spasms. Dehydration can result in low sodium to the muscles and cause spasms. Usually, neck spasms are not serious, however, you should seek immediate medical care for serious symptoms of sensation loss in the limbs or shoulders, significant loss of balance, or a stiff neck in combination with a high fever, headache, sensitivity to light or nausea. For a simple muscle spasm, heat therapy and massage can provide relief, along with medications such as Ibuprofen or other neck pain medications.